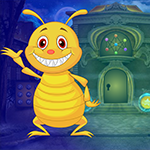 G4K Cartoon Flea Escape is another point & click escape game developed by Games4King. There was a magnificent palace in a beautiful forest. That palacial mansion was majestic in the middle of sprawling woods. There, a cartoon flea lived, and very clever it was. One day, the flea got stuck in a room there. It is your duty to save the little bug. It will help to find all the spots that are hidden, retrieve objects and solve puzzles to aid your mission. Good luck and have fun! 1 - 9 hint is wrong. Just place as you normally would.